Good morning! 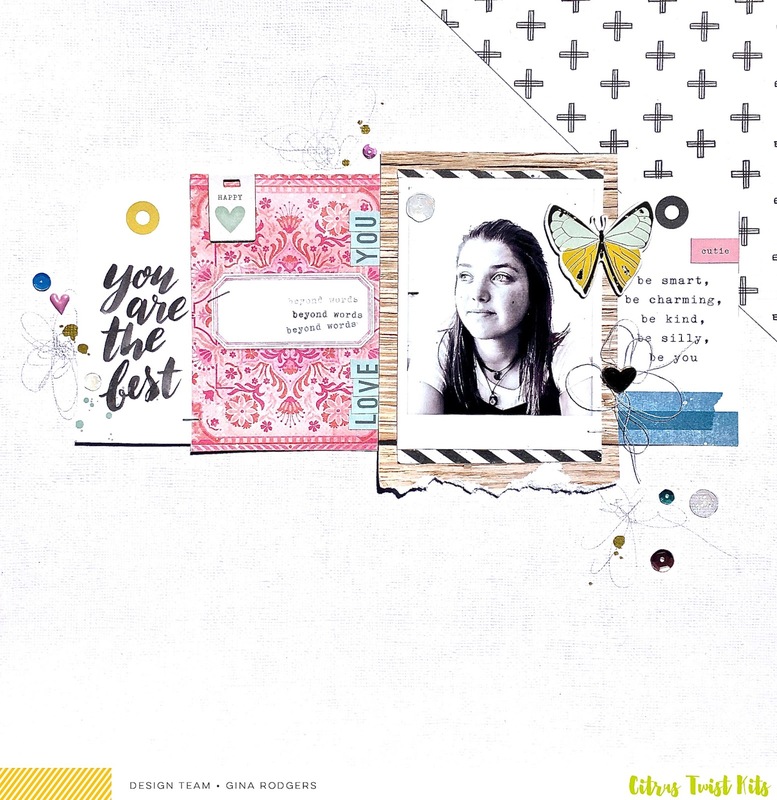 It's Claudia here with you and today I'm sharing a layout I made with the gorgeous Brinley February 2017 Main kit + February 2017 Embellishment kit. I love anything and everything pink so these kits are right up my alley. 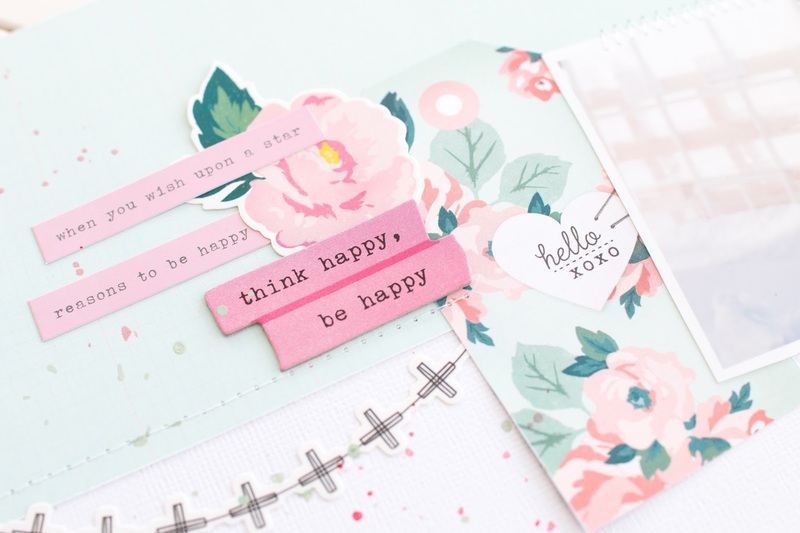 I started off by cutting 2 strips of my favorite papers that are included in this month's kit. I only had to cut into one paper because I loved both sides. 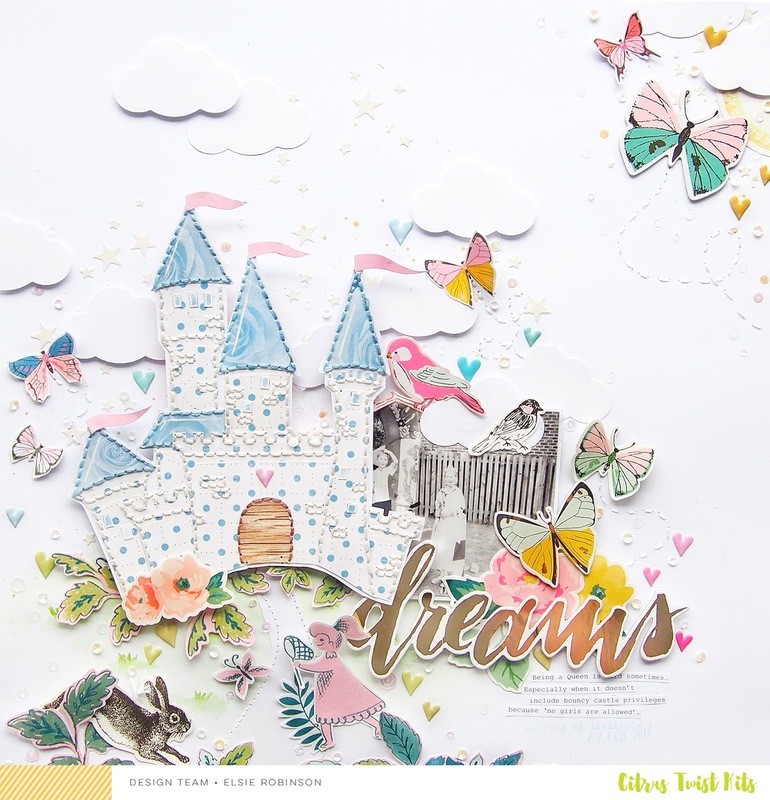 I knew I wanted to mainly focus on the items from the Maggie Holmes Catching Dreams collections that were included in the kits. I selected some of the papers I wanted to use for the layering and grabbed a piece of vellum from my stash. 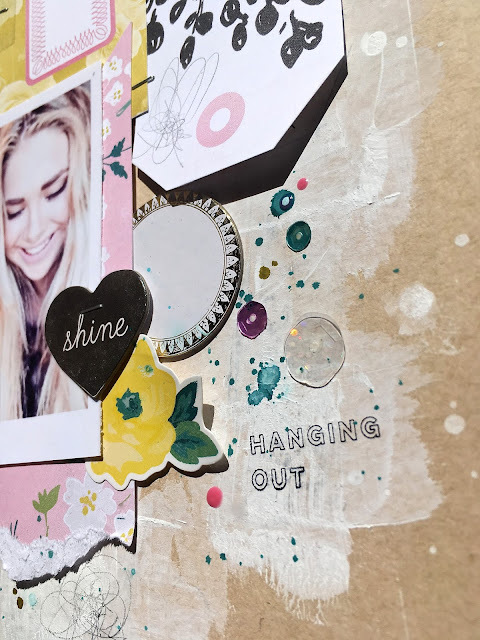 This is a great way to add a different texture in between your layers or to tone down a certain paper that you are using for your layering. I added some foam tape behind my photo so that I could add some of the chipboard thickers from the Main kit behind it. I love the dimension this adds. 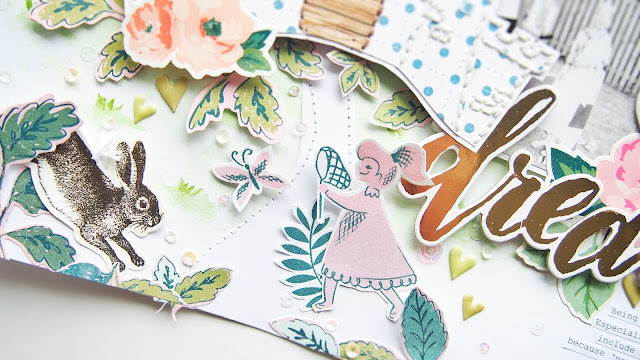 I love these cork shapes from the Hazelwood collection by 1Canoe2 that came in the Main kit, I thought the butterfly worked perfectly with my layout. I added a pink heart on top of it to add a pop of pink and to make it look a little more interesting. The last thing I did was add some gold splatters using the Heidi Swapp Color Shine Gold Lame mist from my stash. Thank you so much for joining me! I hope you enjoyed seeing this layout and that you feel inspired to start creating. Have a wonderful day! Hey everyone, it's Elsie here! Hope you're having a fabulous weekend. Sketches are such a great starting point for your layouts; I always love working with them. This week's Sunday Sketch is a really fun one, so let me talk you through how I used it. As you can see I kind of deviated from the sketch, but the structure is still pretty similar as I kept the idea of three main elements. 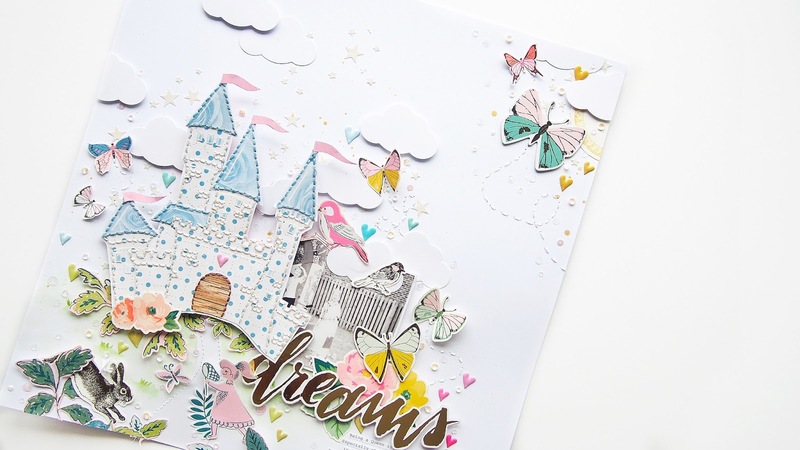 Because the paper-pieced castle ended up being such a large element, I decided to only use one photo, so it didn't make the layout feel too overwhelming and busy. 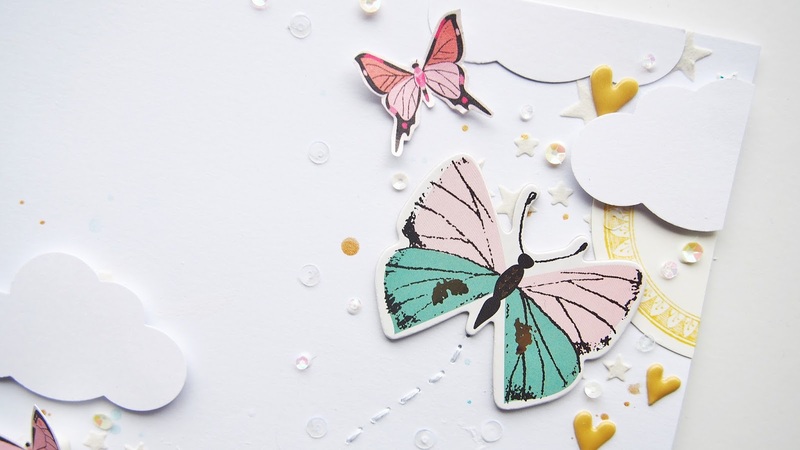 To account for not using a second photo, I added extra details on the bottom of the layout such as the girl and butterfly, which I fussy-cut from the cut-apart paper in the Main Scrapbook Kit. These work as my third main element. I loved the cluster on the top right corner of the sketch, so I kept that the same. 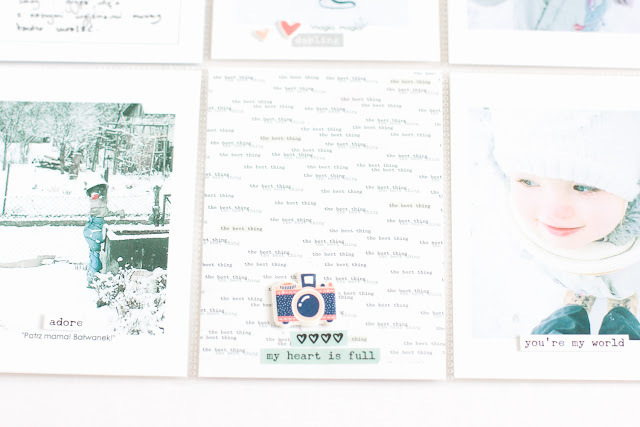 How cute are the CTK exclusive puffy heart stickers? I used them on the layout "tone-on-tone" style, I especially love how the green ones look on the green watercolour grass! Talking of watercolour and mixed media... The sketch had a large piece behind the three elements, you could totally use paper, but I wanted to add something a bit more subtle. I used some modelling paste through a star stencil instead, and I think this makes my Princess Castle look even more magical!! To play along with this week's challenge, create a layout inspired by the sketch, upload it to the Citrus Twist Kits Gallery with the sketch date (2/26) in the title, and you might win a $5 gift certificate to the CTK store - yay! I can't wait to see what projects you come up with! Today we have a treat for you! 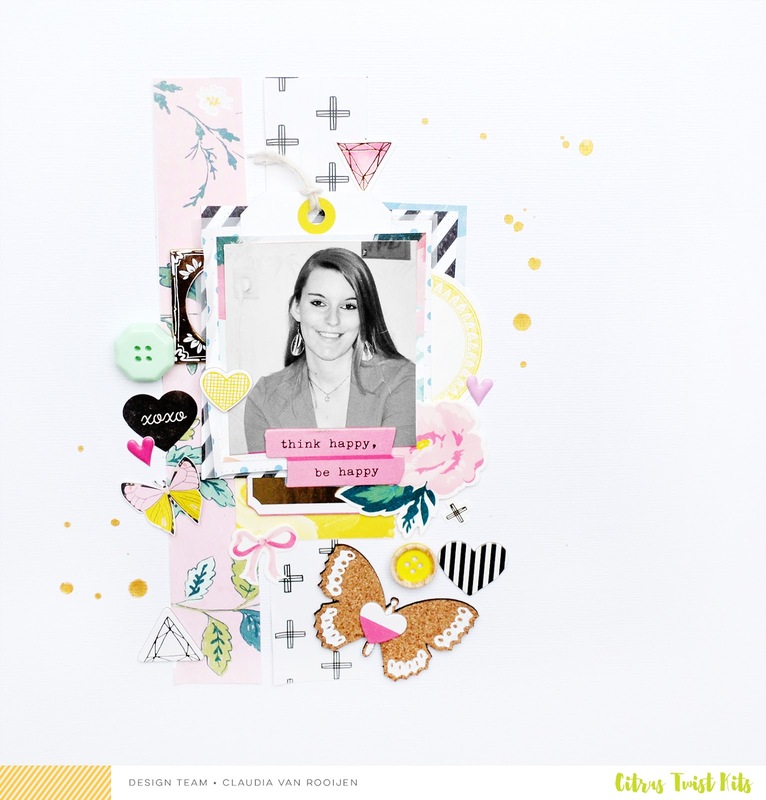 Me (Veera) and Andrea joined forces and both of use created layouts to this weeks' 3 To Inspire challenge. For this layout I used February main kit and embellishment kit. I used pink as my main accent color using pink word stickers and those beautiful pink flowers. As the top part of the layout is full of embellishments I balanced the layout by using a lot of white space. 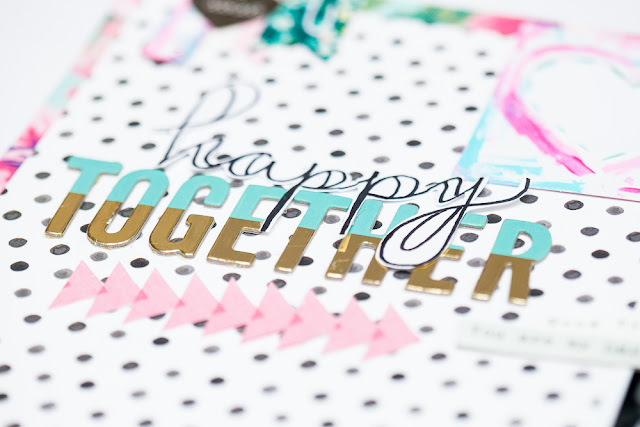 Lately word stickers have been one of my favorite embellishments. 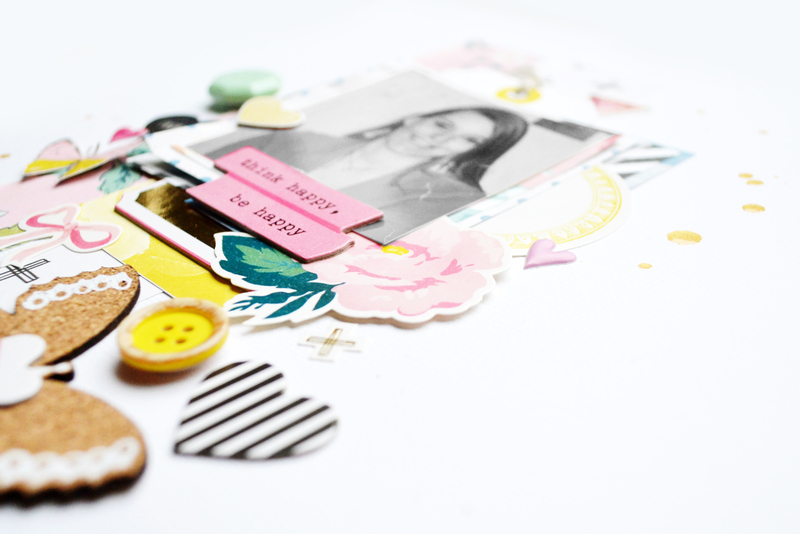 These stickers can be used for telling the story and they are easy embellishments that helps the layout look finished. Hi there everyone! 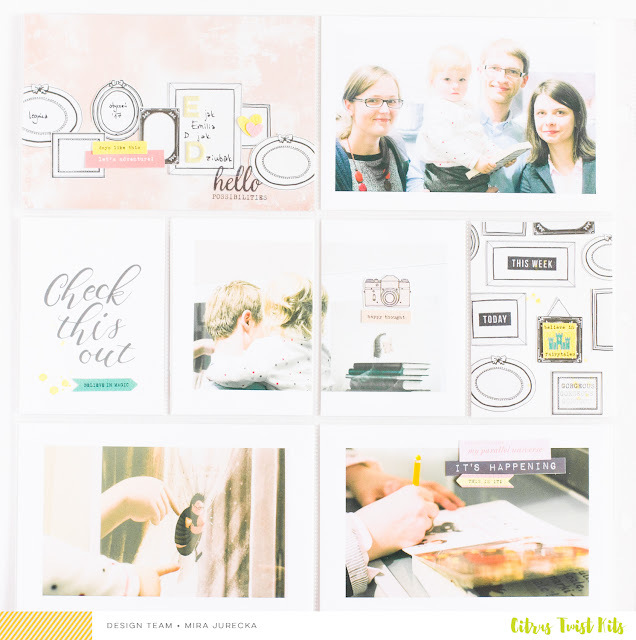 It's Andrea here and I had so much fun working on this special “3 to Inspire” with Veera for you all! 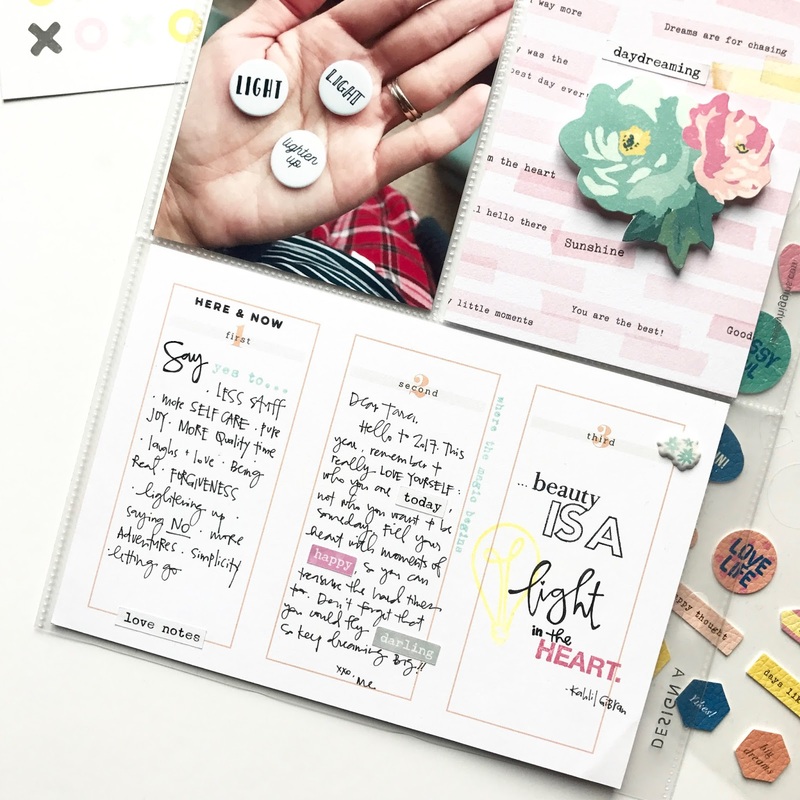 When Veera and I picked the three elements of this challenge – sewing, word stickers, and the color pink, I was so excited because I knew that these would all work great with the Citrus Twist February kits and the over-all feeling of February which is frankly quite sweet and lovely (due to the nature of Valentines Day I think). So here you have it, inspiration and 3 prompts! 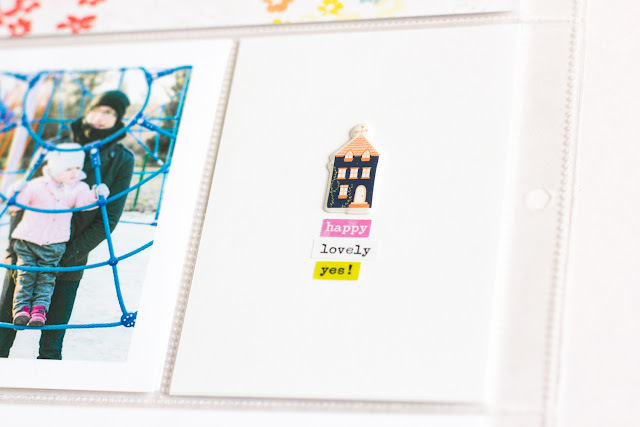 I hope you enjoyed both of the layouts! 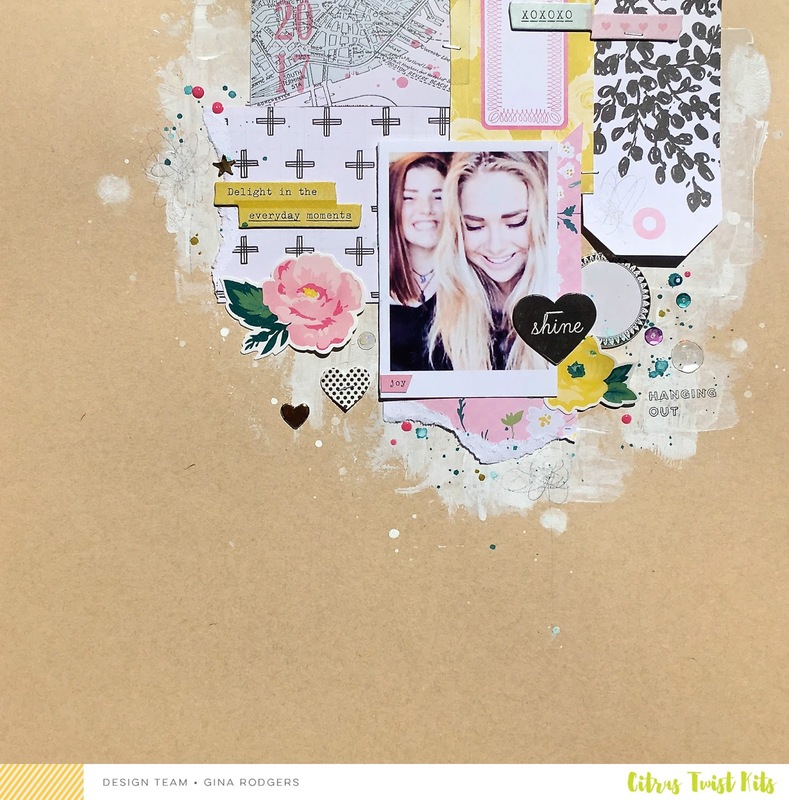 Remember to join me and Andrea in this challenge and when you make your own layout or other project using these prompts, please share with us on the Citrus Twist gallery, the Facebook Forum and also on Instagram! Don't forget to tag @citrustwistkits and hashtag with #citrustwistkits and #ctk3toinspire! Happy Friday friends! So glad you're here for another sketch challenge and an opportunity to win some happy mail. 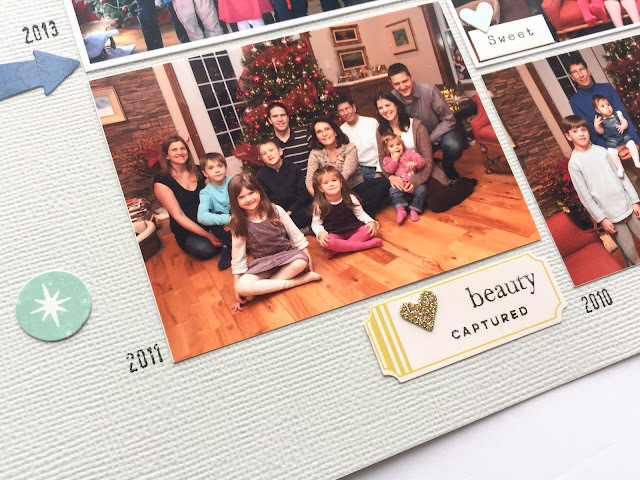 I'm sharing my personal album today - it's my first time working with the 6x12 size and I'm completely smitten with it! 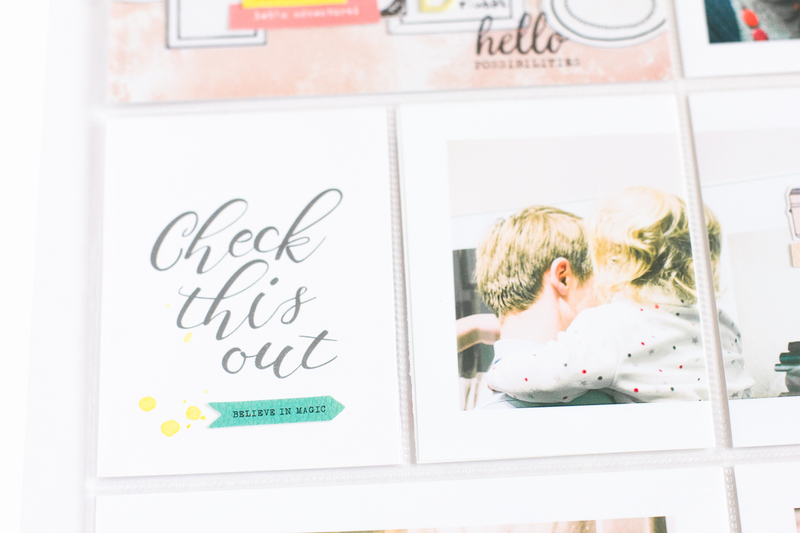 The February Brinley Pocket Life kit is so fun! 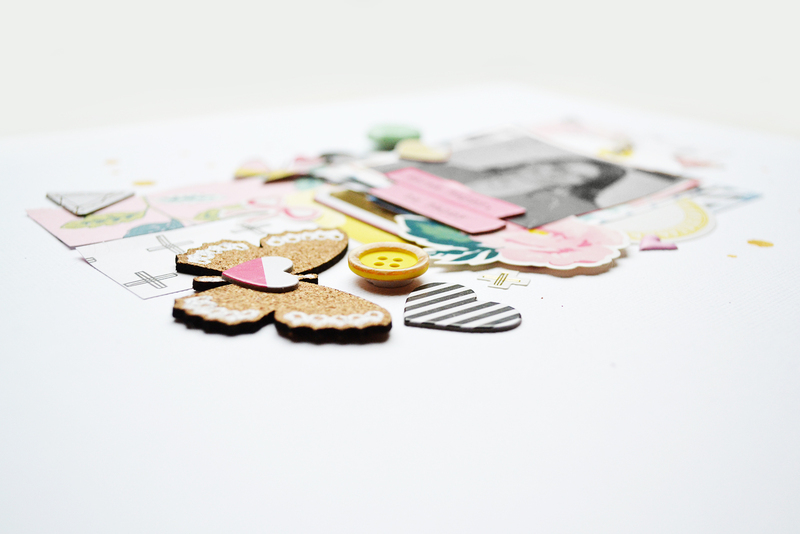 My most favorite bits are the leatherette stickers - exclusives of course! This girl can't have too many hearts in her life. 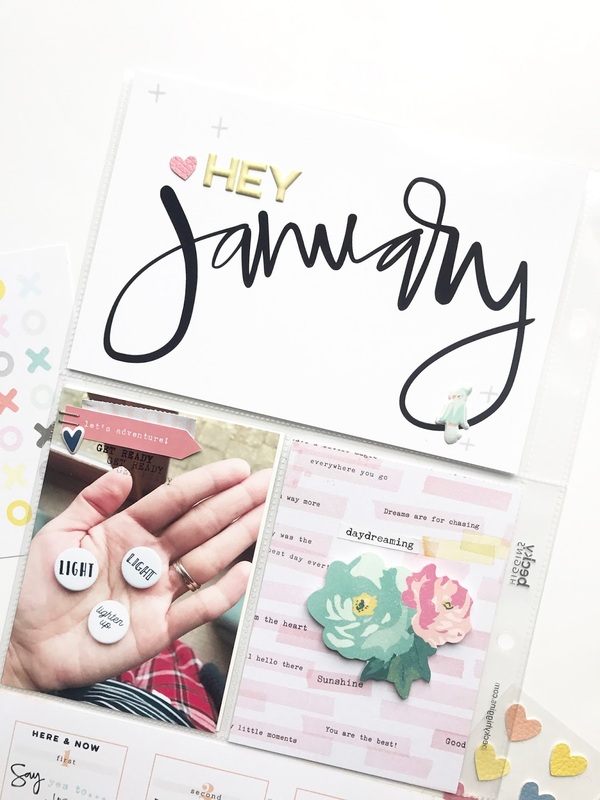 I used my "January" lettering I shared here and decided to re-size it. I added the lovely yellow puffy alpha stickers and a couple more to keep the look clean. As you can see, I originally planned for my 3x4 photo to be on the right side but changed it up in the end. I love how it turned out with a little bit of a switch up. My One Little Word this year is light. 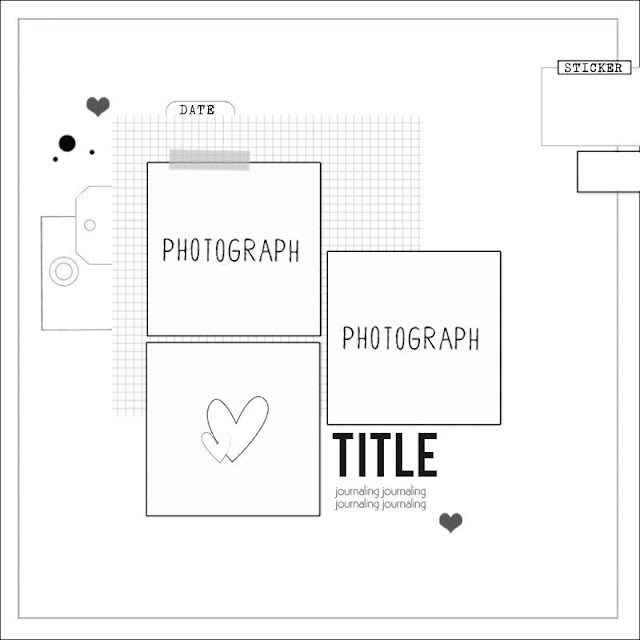 I'm excited to document my journey with my word this year. I made my own journaling card with the patterned paper, a piece of floral ephemera, and a word sticker. 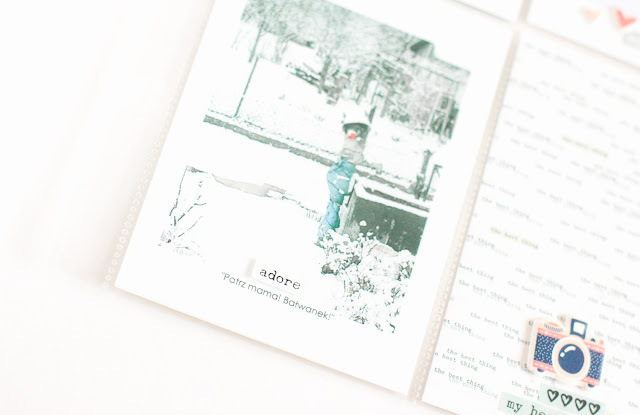 This journaling card was one of my favorites. I really want to focus on getting more words and stories told this year. I added a "yes to..." Citrus Twist stamp from an old kit. I loved the Pretty Little Studio word stickers in this month's Embellishment kit (that Claudia designed) so very much I wanted to use them everywhere! I added in the "beauty" stamp and a couple stamps in my stash to write out a quote that resonates with me. Thank you for stopping by today. If you would like to join in on the fun, create a project using the sketch above. Then post your project in our Gallery or Fan Page by Friday, 03 March. Don't forget to include PL 02/24 in the title! This month I was "working" with the "bright side" add-on kit and there were so many pretty embellishments, that I ended up not even using the papers!! Every year, since 2010, we take a family photo at Christmas time. Nobody like to do it, but I force them. ;) And this year someone told me: it would be fun to see them all together. Well, here they are! And I love to see the growth of the kids. 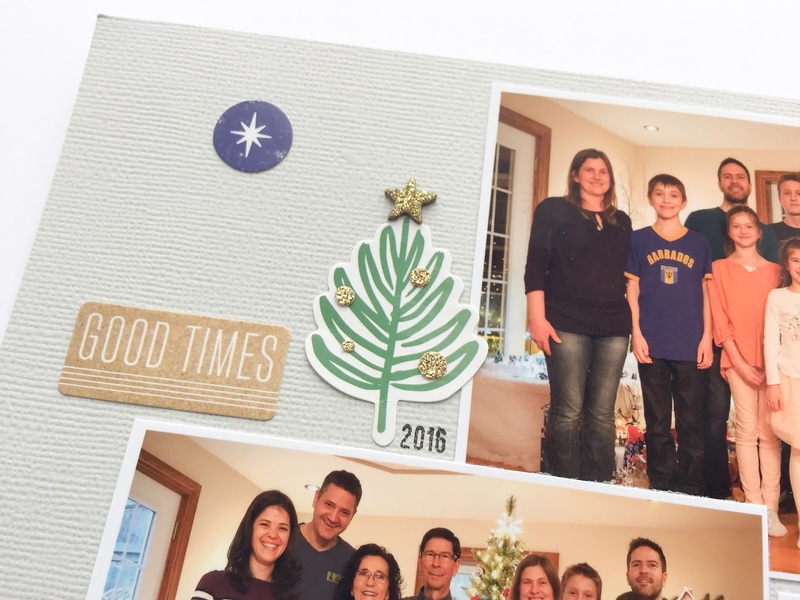 I used the grey cardstock as my base and I crafted the title with the chipboard letters, a word from the sticker sheet (I let out the "friends" that was attached to the "family") and a label, also from the sticker sheet. I wrote the word "obligatory" with my brush pen. From one of the palm leaf from the sticker sheet, I created a Christmas tree. 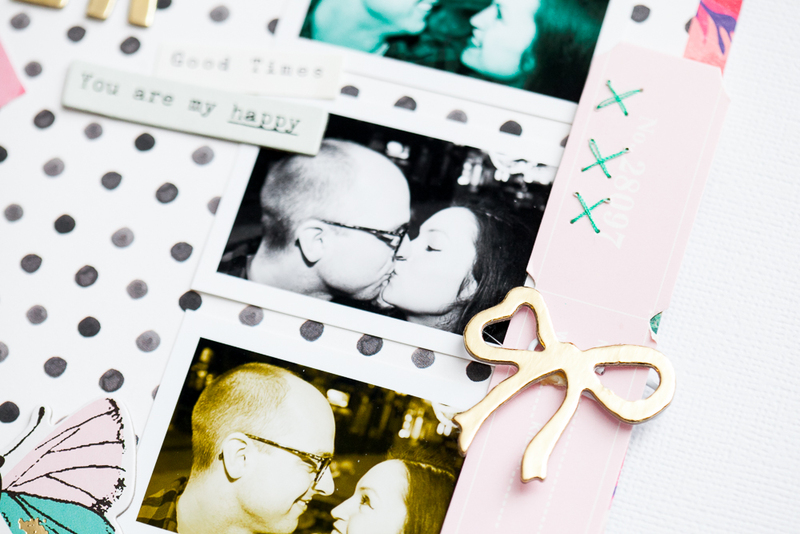 The glittery dots are the centers of the geotags and anchor and I used a star that I found in my stash. 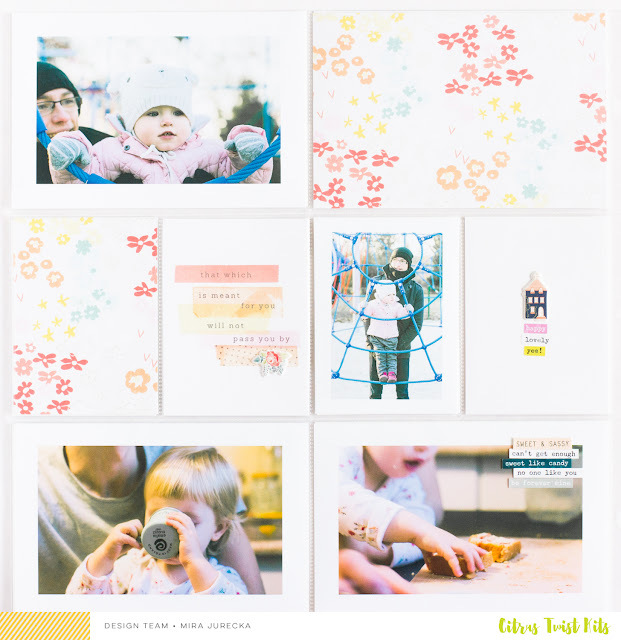 I used a grid composition with different sizes of photos and I added small embellishments to guide the eye all around the grid. I also stamped the years each photo was taken. 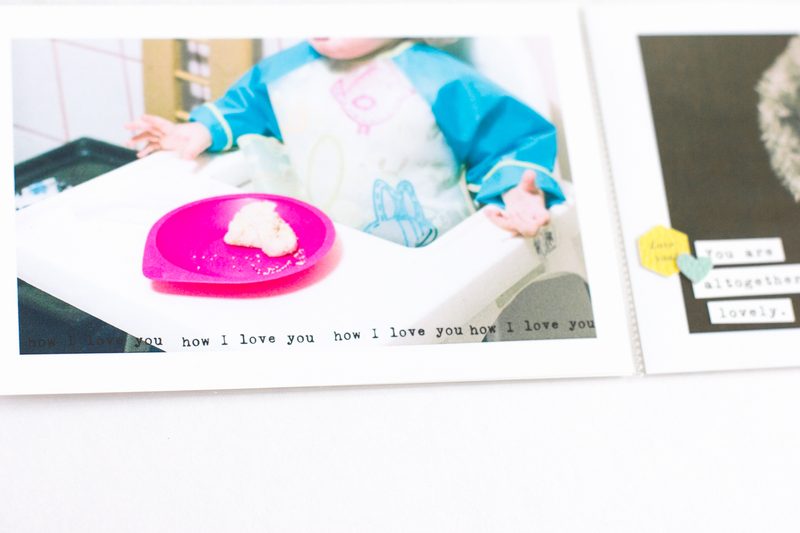 I used the "happily ever after" stamp set to stamp on the yellow label. 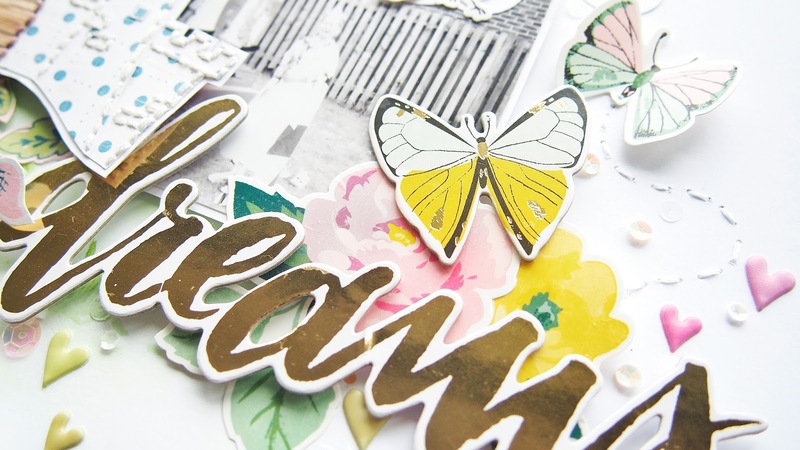 I love the gold glitter on the stickers!! And here I have a very simple layout with a story that moves me. 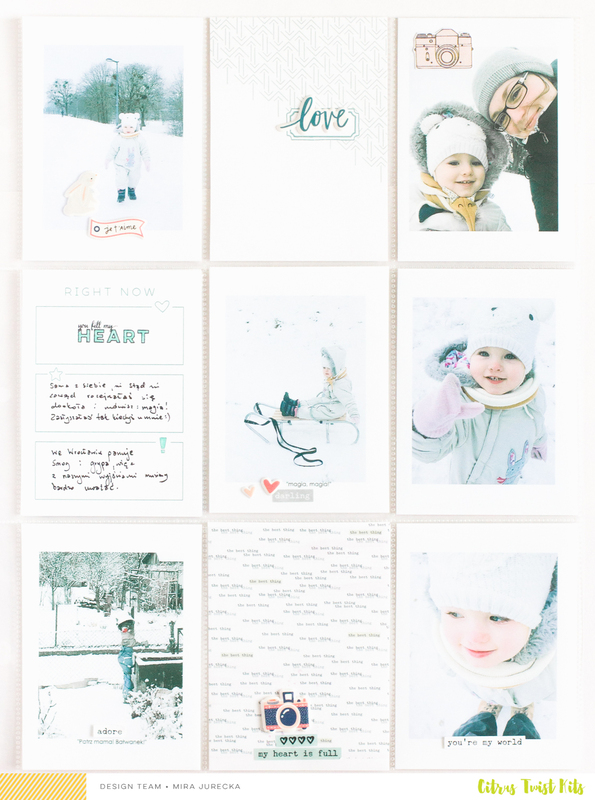 Hi everyone, today I'm sharing a couple of pages created with the gorgeous February kits. 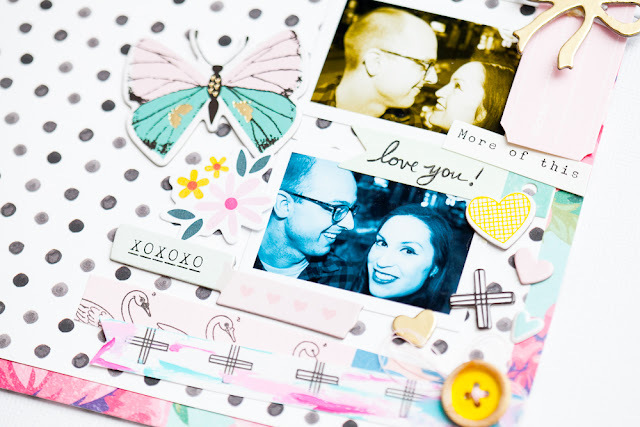 On this first page I've used the Brinley main kit and embellishment kit. I've played around with a mixed media background on kraft cardstock - I love the combination of pastel colours and white gesso against the kraft background. My second project was created with the main kit only. 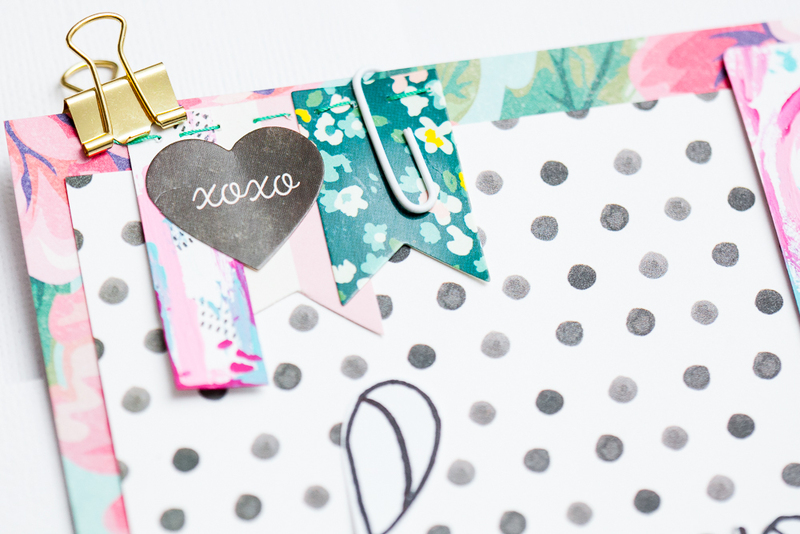 I've used a simple horizontal design with the addition of a corner pattern paper piece. 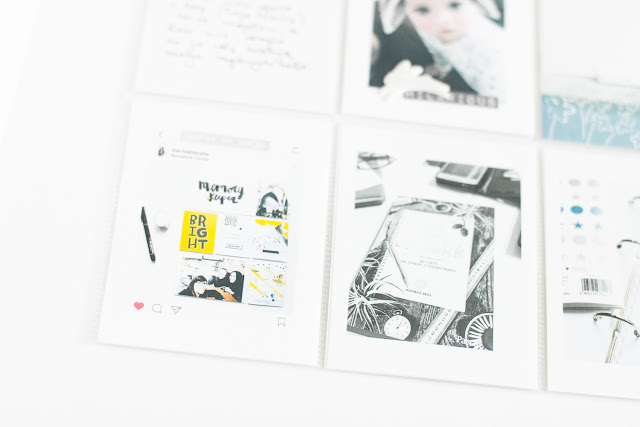 Black + white geometric papers are great for this purpose, they are not as "heavy" as a bright or solid colour, and won't compete or draw the eye away from the main feature of your page. 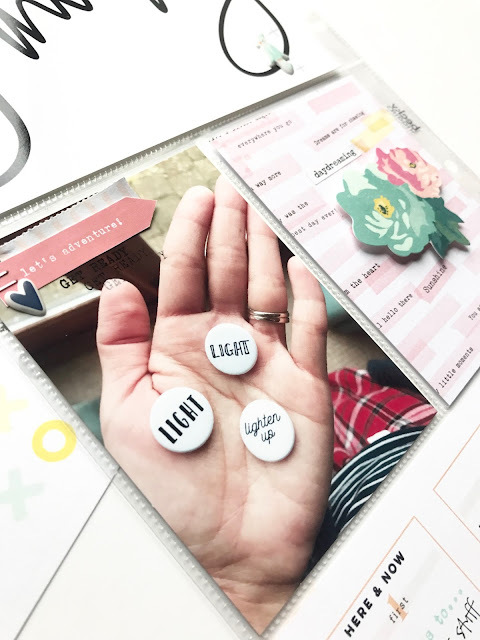 Have you been creating with February kits? 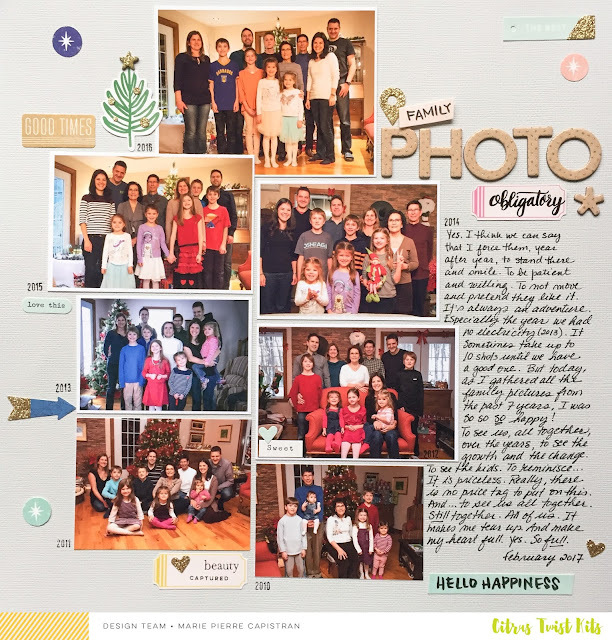 Don't forget to share your projects in the CTK Facebook group and gallery! 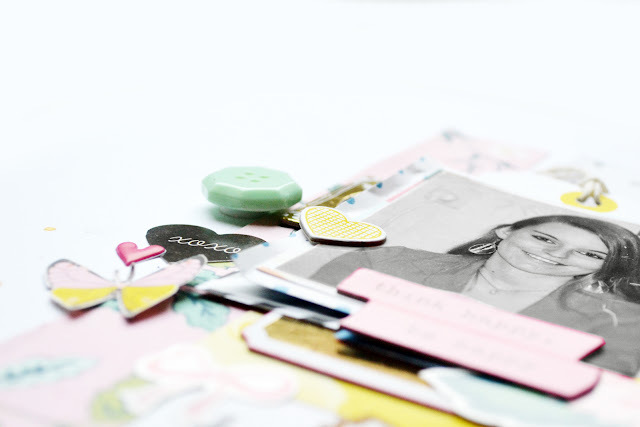 It's Mira here with Tuesday Tutorial and today I'll be fully concentrated on Pocket Scrappbooking, which for me is the best kind of memory keeping project EVER! What about You? I'd like to share with You a few general tips together with a bunch of my favorite tricks that I use very often in pocket albums. I have a couple of pages prepared to illustrate those tips and all of them were created with February Pocket Life and Embellishment Kits from Citrus Twist Kits. So yeah - let's do it! 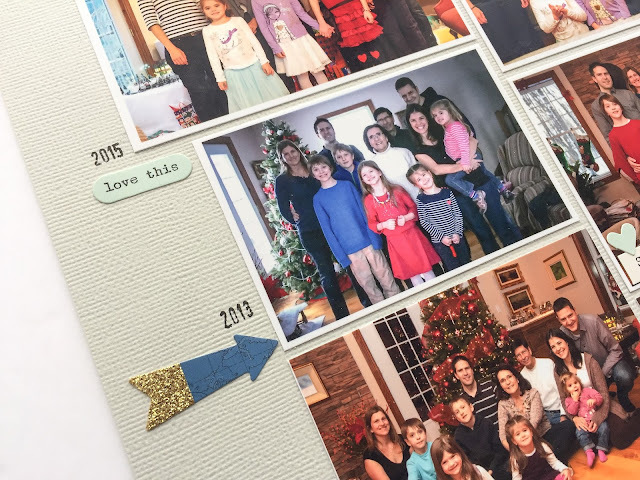 I've documented last four years of my family life in pocket albums, and creating process has changed many times before I decided what's the most important for me and HOW I want to preserve our memories. When I was pregnant I found out what's the reason why I am doing it, why I keep devoting so many energy and time to create more and more pages. It wasn't only because I enjoyed creating them. It was because I knew for who I am doing it - for my daughter. And this is why my albums are mostly focused on this little lady growing up. I knew I want our albums to be a beginning of many many future conversations - a super cool way to bond. This is why my pages are always overloaded with pictures and I have plenty of pages dedicated to journaling all the little stories from Her childhood. Sooooo... my first general tip for You is to find Your reason why - why are You doing Your albums? 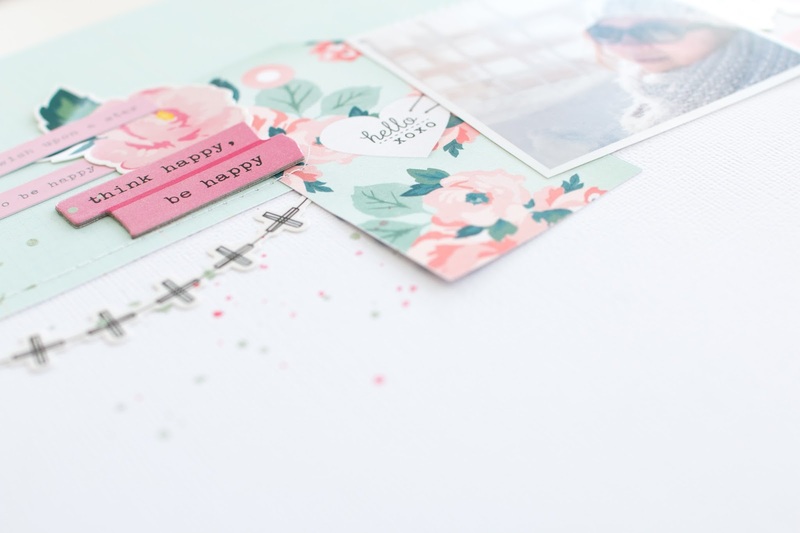 It will definitely keep You motivated and will establish the way of how You create. When a few weeks ago on Instagram I asked You Folks what You would like me to write about in today's post, there was this one topic that a friend of mine raised - a color consistency. So here's my second general tip theme for You today. Color consistency between pictures and all the details that You add to Your pages: cards, embellishments, etc. Color consistency is this funny thing that I find very appealing when it comes to looking at the album pages and enjoying it's aesthetics. 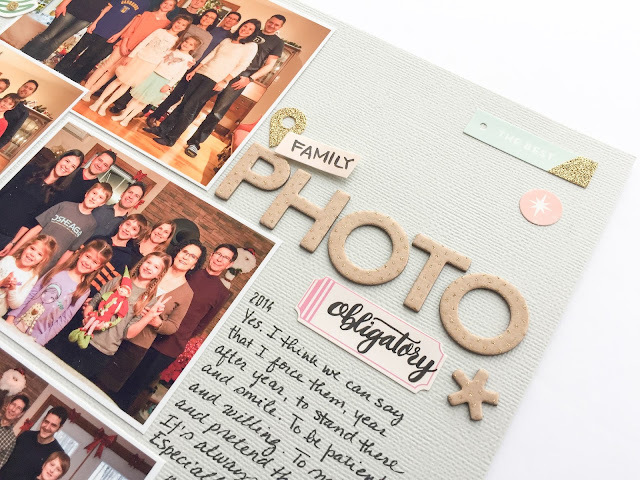 It begins with the environment You live in, the pictures that You take and goes through Your picture - editing process, to the choice of pictures, cards and embellishments. 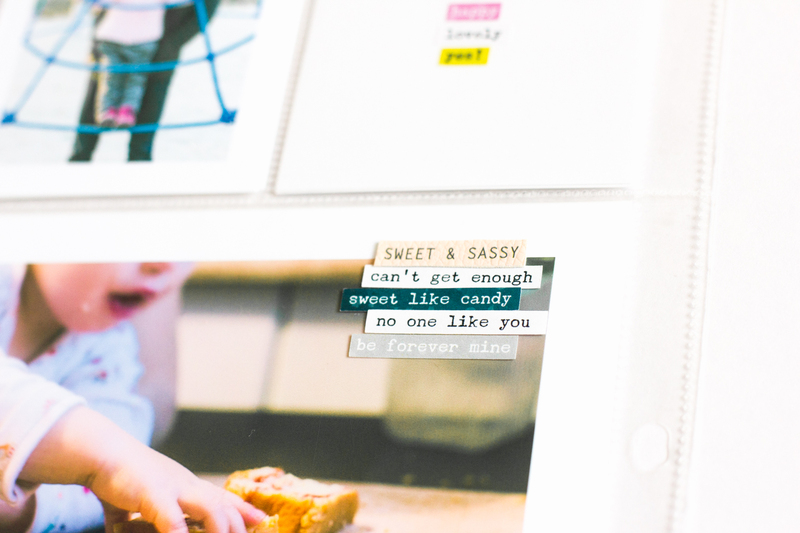 For example I like keeping my album bright and detailed, so I take plenty of pictures of everyday details. 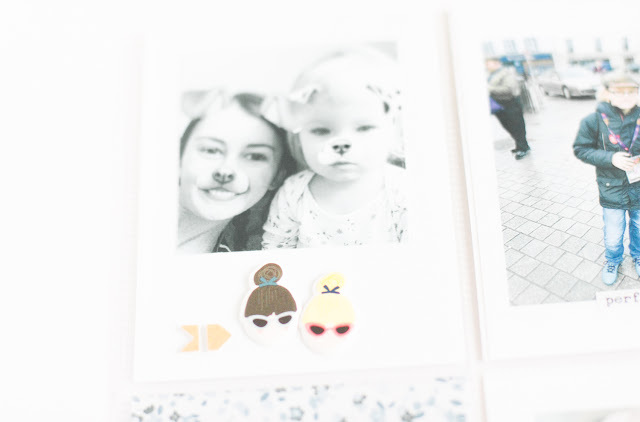 I always edit them in a similar way - my pictures are rather pale and I often add white frames around the pictures before I print them, which gives me a lot of space for embellishing. 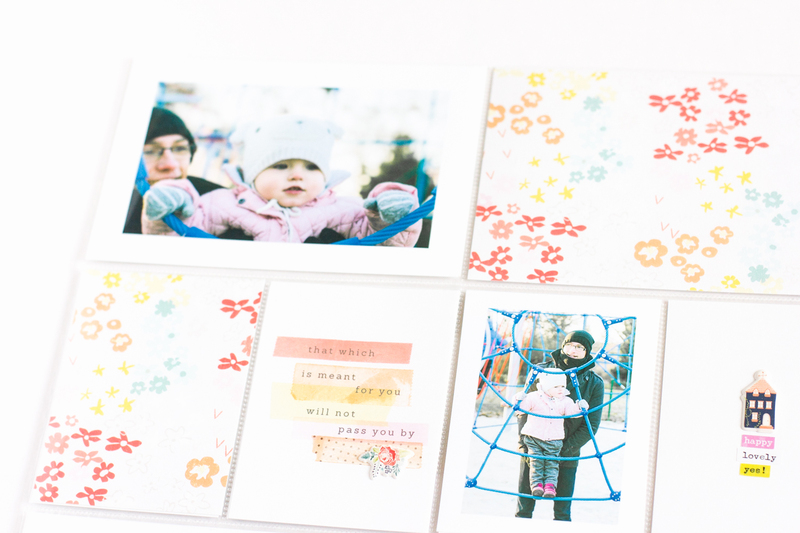 Also I choose the cards that suit the colors from my pictures - they have to go together really well. Obviously not all of us will be interested in color consistency. Some of us like experimenting, some has to try new techniques, some of us just don't care about the colors or just don't feel it. And it's all fine! It's all great! At the end of the day we just need to enjoy the process. 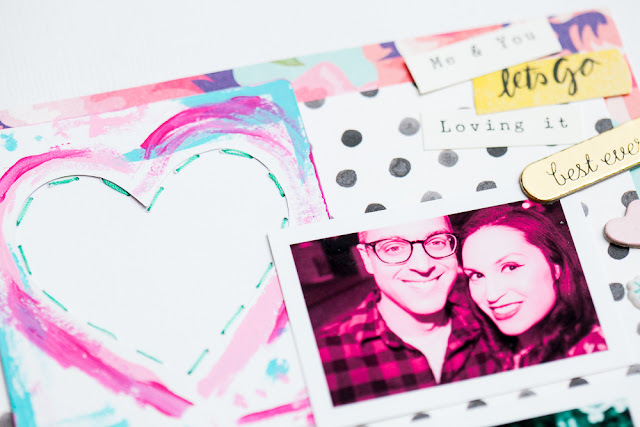 Pocket scrapbooking is not about freaking out and comparing albums with others, it's about having fun and preserving memories! 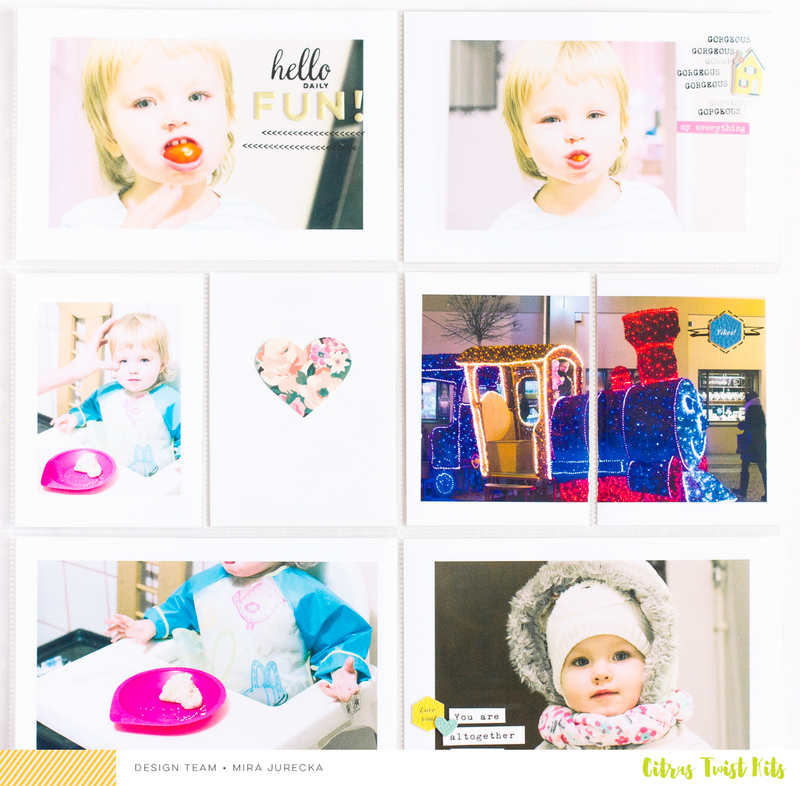 As I said previously: creating albums is all about having fun, so don't create too many rules for ourselves! This is our album, our project, our creativity and there is no such thing that would work for everyone the same way. Just find Your way, and feel free to change it any time You want. Ok, now it's time for details and some random tips that I'd like to share with You! Are You ready? What my daughter really like is touching every little and colorful detail that embellish our pictures in the album. She always finds them all with her little fingers, so I started adding embellishments on top of a page protectors, to make this experience of her even more interesting. Does it sound fun to You? I love creating custom PL cards with the use of white cardstock and embellishments from CTK kits. They are complementing my pictures in a very fun and simple way. Would You try this idea? 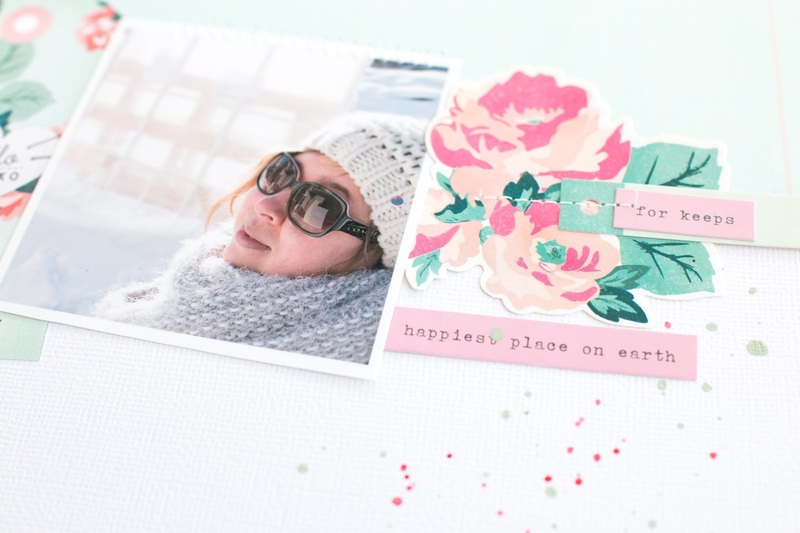 Customizing already existing PL cards with embellishments isn't anything new for our scrap community, but I always love adding that little touch of personality to the cards. Have You thought about it as Your personal signature? Is there a specific way that You like to do it? Have You tried stamping directly on Your pictures? I know there are people who are afraid of ruining the picture, but You know what? 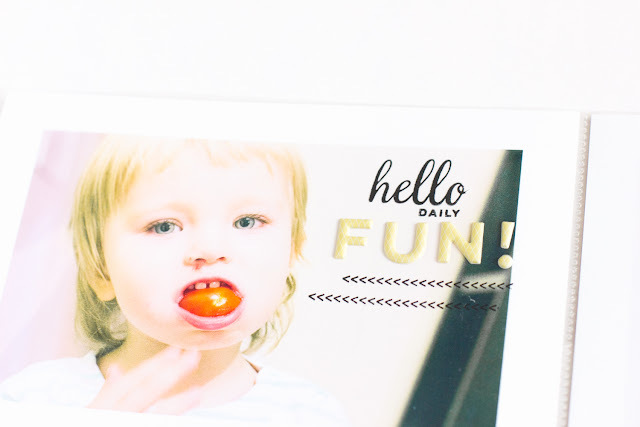 I always do it and believe me I am a queen of bad stamping! Splashes! Another perfect way to customize a card! Have You tried writing down what people around You said and adding those words to Your albums? Obviously, I don't mean every.single.word. I mean funny things. From time to time. 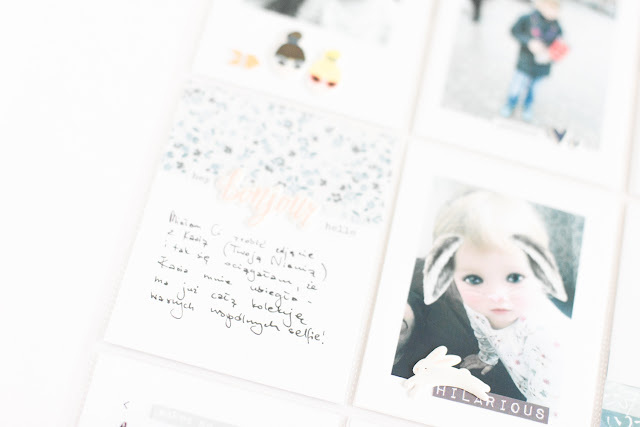 Quotations are rare in my albums, but I love them badly! Especially when our daughter says something funny! Look at this strange water-related object wrapped with some blue plastic foil with a red "nose" (whatever it was), located in someone's garden and covered with snow. She looked at it and said: "Mommy watch! There's a snowman!" Isn't that cute? It'd definitely worth remembering. Another fun thing is to use a product packaging in Your pages. In February Embellishment kit there was this awesome set of tiny word stickers with a super cool packaging - tiny words as a pattern (It could also be from puffy-stickers, I am not sure :D). I used it as a PL card. Bunny (or other animal) picture. Okay: this is must have! I found similar pictures in a few albums from the Internet, and it's great! I don't even know how to take this picture (there are probably some apps on Your smartphones that allow You to take them! ), but the other day our Nanny just took them and sent to me. And I couldn't miss placing them in album. Awesome! And my last trick is from similar category: screenshots from Your smartphone telling what was the weather like, or Instagram pictures telling some story. 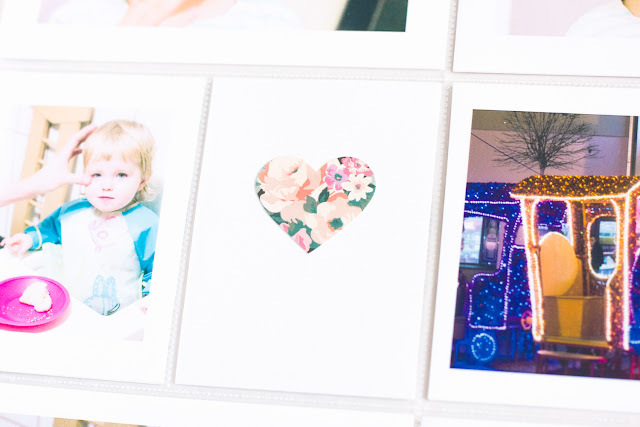 These are two fun ways to change things up a bit in our albums. Aren't they fun? Okay, that's it for now! 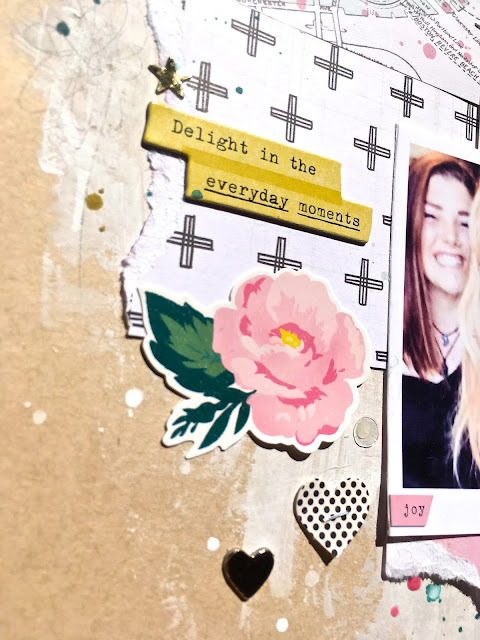 I could continue writing this post for ages, but I don't want You to get bored, so I'll leave it for another time :) I hope You feel inspired to create, or simply to share some of Your fav tricks with other Pocket Scrapbooking Fans! Feel free to do it!